Congratulations on your upcoming wedding! How exciting to be starting a new chapter of life and love! We’re big fans of weddings here (in case that isn’t obvious), but we also know that the whole process can be daunting – so we hope to help alleviate some of that stress. Don’t let the stress give you cold feet! Here at Cedar and String we believe that it is downright ridiculous to pay exorbitant prices for wedding invitations. As a married couple, we know firsthand how expensive weddings can be, and when we started this company we determined that we were NOT going to be part of the problem, but part of the solution! 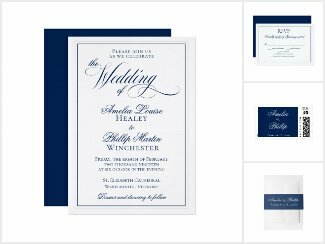 Our goal is to provide you with the most beautiful, custom – and customizable – wedding invitation suite that you desire, without the added costs that big-name designers and printing companies add! It’s one of the reasons that we are so excited to partner with Zazzle.com. Yes, the name is funny, but trust us – the products are amazing! Zazzle provides a 100% satisfaction guarantee, outstanding print quality on a variety of paper types and products, and the unique option for full customer customization so you can see your work in real time before you order it! That’s actually one of our favorite features: the ability to see what your invitation, RSVP cards, menus, wine labels, or even cake pops are going to look like as you are creating them – not at the end, not having to wait for a “proof” to show up, and best of all, not when the invitations arrive at your door! Don’t be discouraged by the price of invitations or other parts of your wedding suite. At Cedar and String we are happy to offer you a great volume discount! The discount varies by product, but as an example: if you’re purchasing at least 250 invitations, you earn a 45% discount! We challenge you to find these kinds of savings at your standard, big-name invitation websites. In fact, we took that challenge ourselves! We put together a mock order of 250 invitations, RSVP cards, details cards, belly bands, and custom envelopes with Zazzle, and looked at the cost. Then we went over to one of the top wedding invitation websites (we won’t name them there, but they were in the top three hits on our Google search for “affordable wedding invitations”), and put together a set of the same products, focusing on matching the PRICE. We tried multiple times, and each time we found that the only way to pay less on their site was to strip our invitations down to their bare bones: no colors or fancy fonts, no fancy paper, no printing on both sides, and so on. And even then the savings was only going to be a few dollars. We were frustrated at the amount of “upselling” there was, and quite frankly a little disgusted by the fact that they tout themselves as an affordable option! At our Cedar and String Zazzle shop we were able to choose the colors, fonts, and even adjust the layout of the words and designs. Oh, and don’t get us started on the ease of design at Zazzle! We found ourselves wondering how that big invitation website gets any customers at all with its not-very-user-friendly templates. Zazzle takes the guess work out of the whole process AND double checks to make sure you get what you want! Here’s a great example: at the big-name site, we went through process of selecting invitations and then trying to determine what we could get for that price. Without going into detail, suffice it to say that it was not easy (see previous paragraph! ), but we managed alright. Here’s the thing, though – we didn’t bother to change any of the wording or names on the invitations – first because we weren’t actually going to buy them, but also because it was hard to maneuver around their template. So we picked our products as they were presented and loaded our cart, and all that was left was to push that big “buy now” button. At no point did their system recognize that we were about to buy 250 invitation suites with some random couple’s names on them! With Zazzle, you can trust that you’ll have back up throughout the entire process. How many invitation designers can say they’ve used their own product? We love that scene from Miracle on 34th Street where Santa suggest so a frantic shopper that she try the competition’s store and then he almost gets fired for it – until the bigwigs at Macy’s realize what a great idea it is! We feel that way about the whole Zazzle marketplace. There are hundreds (probably thousands!) of designers over at Zazzle, creating everything from wedding invitations to fabric to lampshades. Yes, lampshades. So if you don’t find something you love at Cedar and String, look around once you get to Zazzle – you will find what you’re looking for, we’re sure of it! And you’ll find a company full of designers who want to help you just as much as we do. Full disclosure: As a Zazzle designer, we participate in affiliate marketing, so if you head to the Zazzle marketplace using any of the links in this post or anywhere on our website, we do get a few pennies of the royalties on whatever you do decide to buy, even if it isn’t from us. But quite frankly, we would still send you there even if that wasn’t the case. However, since we’re in full disclosure mode, we would like to make sure you understand that Zazzle allows designers to set their own royalties percentages, and there are designers in the marketplace who set theirs so high that you’re really not saving money by using their products. At Cedar and String, we keep our royalties as low as possible because we believe every bride should be able to have her dream wedding without breaking the bank! So if you see another designer’s invitations and they’re a lot more expensive than ours, let us know; we won’t be able to offer you their exact design, but we can help you find one of ours that is closer – or even design one just for you! If you’d like to go directly to our Cedar and String store, just click below (or any of the images on this page). If you’d like to browse around our Cedar and String website for a while, click here to be taken to our portfolio page. The wedding invitations, RSVP cards, favors, and wedding accessories you see on our website here are templates that are provided to show our customers what your end product could look like. If you click on the items in the individual posts, you will be taken directly to Cedar and String’s store at Zazzle.com. From there, you customize the text, colors, and paper types that you desire. You can add or change the words, or even shop other designs at Zazzle’s extensive marketplace. We will work with you every step of the way, and so will Zazzle! Please contact us if you have questions or would like to work with us! p.s. Don’t live in the USA? We’ve got you covered! Click below!